Polo isn't for the penniless but lessons at cheaper UK clubs (generally those further from London) are surprisingly reasonable: from £40 for a group lesson on a hired pony. You don't need to be a member of a club to learn. You don't need to own a string of horses. Many players rent and if you play less than twice a week this can be cheaper than owning. Begin in winter, in the arena, especially if you are new to riding. It's cheaper, the enclosed space gives you confidence and the fact that there are three-a-side instead of four means you get more for your money. There are currently 29 arena clubs in the UK and Ireland. Practise your riding. Carry a polo stick without using it and practise stopping, starting and turning. Learn, understand and remember the rules, most of which exist for safety. Watching games helps as does working towards an umpire test. Start learning in jeans or baggy trousers, boots with a heel and an ordinary riding hat, and invest in specialist polo kit as you go along. Go stick-and-balling as often as possible – tapping and hitting a ball around a field to practise what you've learnt. Join instructional chukkas before 'proper' club chukkas. Or try a 'novice-friendly' format such as County Polo: a three-a-side instructional grass game pioneered by leading coach Claire Tomlinson at the Beaufort Polo Club. 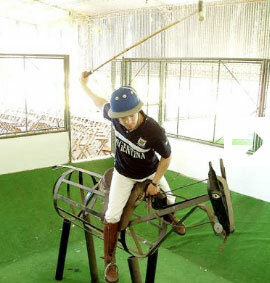 Consider a trip to a polo farm or estancia – you'll improve in leaps and bounds and return fit and tanned. South Africa and Argentina are brilliantly set up for novices and Brazil, Australia, Chile and New Zealand also have good spots.